Hurricane Lane intensified to a Category 5 overnight, but it won’t stay that way. At 2 a.m. HST (8 a.m. EST), the hurricane was about 480 miles south southeast of Honolulu, traveling west northwest at 9 mph. The hurricane’s escalation to Category 5 status motivated the Central Pacific Hurricane Center to issue a Hurricane Warning for Hawaii County, or the Big Island, indicating that damaging winds and surf and flooding rains are possible within 36 hours. A hurricane watch was declared for the islands of Maui, Lanai, Molokai and Kahoolawe, and Oahu. The state closed all government offices on Maui and the Big Island starting Wednesday. In addition, all University of Hawaii campuses were shut down on Maui and the Big Island, as well as Molokai and Lanai. “We encourage all the people across the state to pay attention for this storm. It is different. 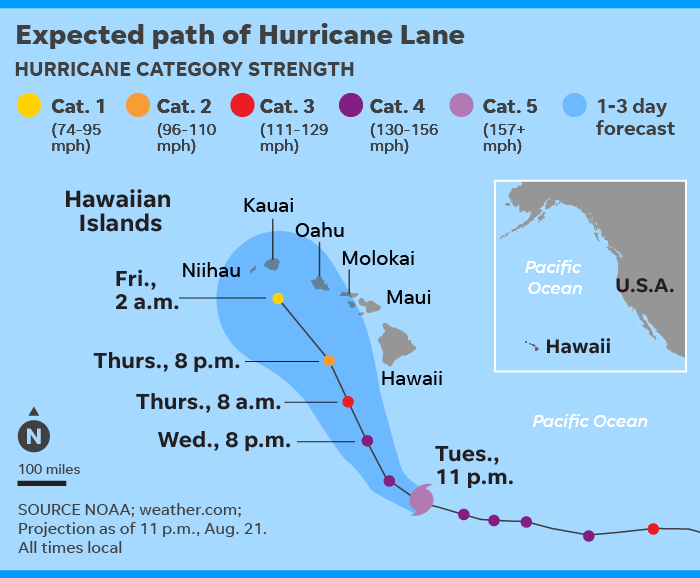 It’s not your typical hurricane that tracks south and goes away,” Ige said.